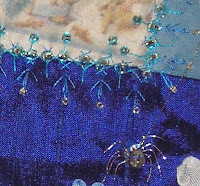 I recently had to do some round robin "Angel" stitching duties.... one of the blocks is Jo's in New Zealand.This is a pic of the block as it came to me.....Then this next shot is of the overall area that I worked on, the a little more closeup shot of several sections. I've been on a "spidey" creating thing lately and so I took a closeup of the one I did for Jo! Enjoy! This year at CQI we have a monthly challenge. It goes as far as we want to take it. One of the pieces of the challenge this month is curves! I LOVE curves!! BUT....I haven't been able to do them on the machine! After MUCH wandering and guidance and trepidation... I finally sat down at my machine and we reached a truce!!! I have the basic idea down now of how to do this! Now i'll have to actually PLAN a block so I can utilize it my new skill! LOL!! I'm not usually much of a planner because that opens the door a crack to my inner critic that i'm ALWAYS trying to shove away! But.... I have one idea I would like to try so I think i'll map it out, dye some fabric (that bit is necessary for this idea to work) and then try and piece. Now....to find the fabric! LOL!! Well.....these blocks have their own charm and certainly aren't the most gorgeous...but I suddenly realized that they are PERFECT for a challenge we have going on at CQI for our novice stitchers! 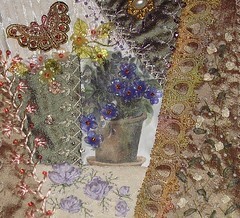 We are doing a sampler of stitches and what better palette than these? Sooo, i'm going to stitch them, one stitch with variations, per block. When they are done, I think this will make a perfect throw! Soooo, utilitarian in ALL ways! I'm sure many of you remember when I first posted this last year. It's been languishing on the design table for a bit....waiting for me to sit still long enough to work on it. Surgeries are over...its a New Year...what better time?? Sooo...I have finally gotten some blocks pulled together (more to come) to go with it! This piece is reallllly speaking to me so i'm hoping I can hold onto that energy and get it further along! I initially had thought that I could do tone on tone blocks surrounding this, but they just were flat looking...so a bit of revision and this is where i'm traveling with them now. I still need more color variation I think but I need a LOT more blocks too so i'm hopefully on the right track now! I am SO excited. 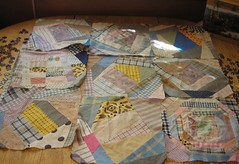 I am joining in on the project with Cindy Thury Smith and will be stitching these two blocks for her. These pictures are of the blocks she sent me to work on. These blocks are HUGE.... at least 14 inches!!! 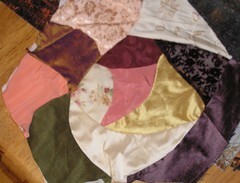 She is re-creating a crazy quilt that will hang in the LeDuc mansion! Apparently they were very linear in their work, so i'm hoping that the herringbone and cretan type stitches with variations will be a good interpretation! 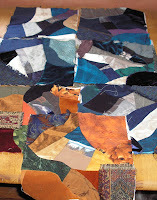 Anyway, this is a good experience and I look forward to seeing the quilt when its complete! 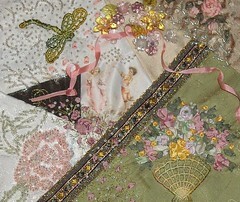 Its somehow comforting to know that at least a teensy piece of something I have stitched on will live on in history! VBG! I used to belong to a yahoo group called the "FairyGoddessMothers". Well, they decided one year to do a color challenge with a "fairy goddess"...This was my interpretation for that months theme which was white and blue. 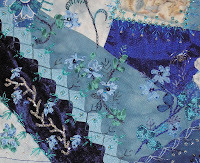 I made a white on white cq background in a landscapey way, then appliqued down the goddess. 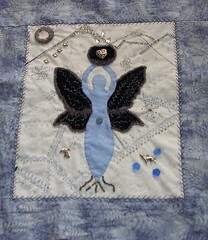 I then stitched the seams with some light blue and beaded the moon and her wings and elsewhere. Well...long story short, she had been languishing on the design wall, and I decided to get her finished up. Since we're doing a challenge at CQI she even works for that! I added some snow flakes to her, feather stitched the very outside seam and will now drop a back on her and she's done! Another UFO done! YEAHHH!!! I was struck with inspiration and had to quickly stitch it up before I forgot! LOL!! This is a little garden scene complete with dragon flies, a trellis of roses, a golden spider web and spidey (under a bower of leaves), moon flowers that glow along the path and some cut flowers waiting for a sweetheart to come and find them. The moon is glinting off the fire flies and the path way that has some rose petals sprinkled along! I hope she likes what i've done! 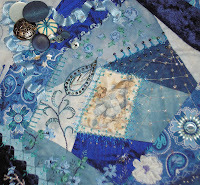 This is my final donation for the charity quiltlet project!!! Isn't this awesome? I LOVE it!! 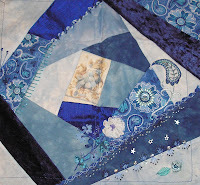 Janet Popish was sooo generous and did an awesome job with this block!! I know the kids are just going to spend HOURS swimming around, goggling all the goodies in these blocks!!! Thank you to Janet and ALLLLL my wonderful friends that have contributed to this project! This is another from Janee! She just outdid herself for this project!! Isn't this great? This came in from Janie in my local cq group! 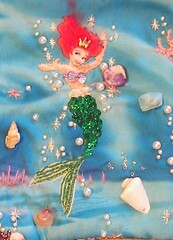 She found some Ariel fabric and made it into a quiltlet for us!! 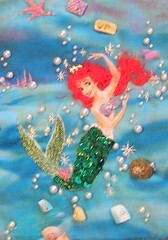 She gussied up the tail with sequins which is really neat!!! Thanks Janie! 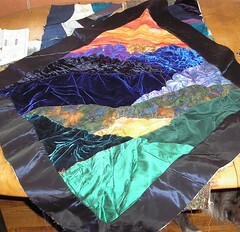 Susan Nixon sent her finished quiltlet and here it is!!! I LOVE it!!! 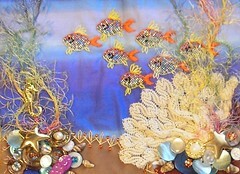 I think she did a super job with the sea weed and the jelly fish and....well, its just a great block! Thank you so much, Susan! This is the third and final block I did for Maire. The silkie needed some help so I did a little bit of "painting". I glossed her lips, brightened her beautiful eyes, darkened her hair and then gave her hat a fix up! 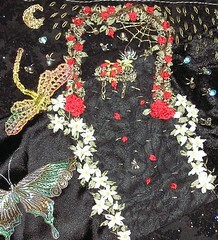 I also added some fsl motifs and beaded them, and used an old earring to add a bit of vintage charm! 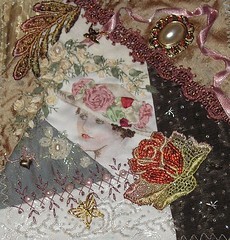 There is a beaded cabbage rose there in the patch just in front of "m'lady"! This is the second block for Maire! I asked her if she liked the Judyth and Katherine beads before I sued them. Being plastic, I wasn't sure! 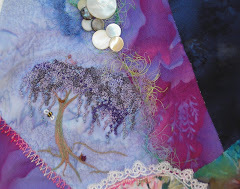 I'm sooo enjoying adding beads to everything....and finally getting more comfortable with sre! PHEW!!! 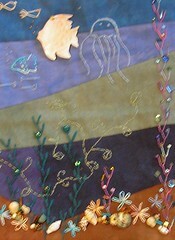 I am a member of CQI, Crazy quilting international and participate in a lot of rr's. I also act as a "RR Angel" when life gets in the way for someone in a rr! This is one of several blocks that I worked for Maire Courtney in the Summer Breeze rr! 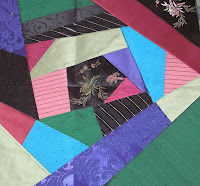 This was a dyb (do your block) and I really enjoyed her colors and being able to explore new techniques. The melanie roses are my first attempt! Still a LOT to learn, but i'm enjoying it! Hideko has just nominated me for the Make My Day Award! 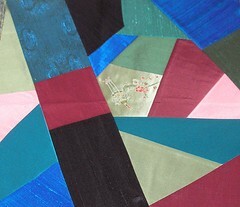 Thank you soooo very much, Hideko! I am pleased to be able to bring a little smile or inspiration for you! You always make my day too. The awards rules are to“Give the award to up to 10 people whose blogs bring you happiness and inspiration and make you feel so happy about blogland! Let them know by posting a comment on their blog so that they can pass it on. Beware! You may get the award several times! ”Here is my List of Blogs that make me happy and Make My Day. Thank all of you forallthat you do! From lessons, to inspitation to just letting us peek into a bit of you! !